Whenever you browse the Internet, some sites are capable of tracking your personal data and activities. 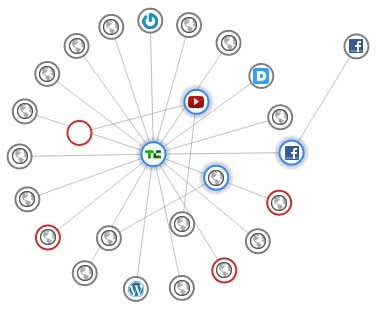 Social Networks and Search Engines generally use this tracking data to provide you relevant results. Many of us would think that this might be a threat to their privacy. Websites not only track user activity both within their own domain as well as other websites. These websites are mostly social websites that collect information on it’s users based on their activities. Google Search results, for example, vary from person to person for the same keyword inputs, because different users browse the Internet differently. On the other hand, by tracking user data, these websites provide more personalized results and a user-friendly browsing experience. By monitoring user activity, they feature more intuitive searches by giving us relevant information. It helps us to find out what we are looking for easier and faster. Collusion is a browser Add-On that shows you all open connections between websites in real time with the help of a graph. It was originally a Firefox Add-On but later on, extensions were also made available for Google Chrome and Safari. This Add-On is aware of websites that track usage data and what other sites are they connecting to. When you click on the add-on, a new page opens where websites are shown as small moving balls while the connections are represented as lines. Open a few websites in your browser and see the Collusion graph. You will notice that some of the data from the open websites are going to some other websites. Detailed information about currently tracking websites is also shown. But the Add-On can eventually block interactions among websites and also blocks ads. You may be secure considering the fact that none of the sites would be able to track your activities but this add-on may prevent you from getting useful information from other sources that could otherwise have reached you. Disconnect.me also protects websites from sharing/tracking user data. It is a browser add-on that stops websites like Facebook, Google, and Twitter (+ LinkedIn and Yahoo! for Chrome only) to track user information. However, you will not be getting personalized search results since the websites can no longer monitor your activities. Disconnect.me is available for Google Chrome, Firefox and Safari. Sites like Facebook, Google, Twitter, etc. are well known websites. They track user data to have more focus on individual users. We all like to find something closely related to whatever we are looking for. These sites are well reputed and have a huge user base. They would not try to misuse your personal information because that would be a big blow to the sites’ reputation. Also, unnecessarily blocking content-relevant ads prevents users from discovering new products that could have been helpful. We recommend our readers not to use such content blocking add-ons because they hamper the social aspect of the community. Only if you are very much concerned with security and feel like the information you are working on is critical, should you go for them.